40′ steel storage containers are roughly the length of two end-to-end parking spaces. These storage containers are popular for several reasons; not only do they hold twice as much as the 20′ containers, their cost per square foot is lower than the 20′ containers. These containers are used often at large construction sites, warehouses, car dealerships, contractors, builders, schools and for many other commercial and industrial uses. They are made of 14 gauge steel providing excellent protection from vandals, thieves and the weather. One end of the containers has cargo doors that swings open so it is important to keep this in mind when thinking of a spot to place your 40′ container. The doors come with industry-standard weather tight gaskets and are lockable. All-in-all, the 40′ storage containers are the preferred choice for temporary or permanent storage of valued equipment and supplies due to their very secure and weather-resistant nature. All of our 40′ storage containers come with 1 inch thick plywood flooring built to withstand a good deal of weight. This flooring allows for for ease of access while transporting your property in and out of the storage container, such as while using a pallet jack or other kind of fork lift. 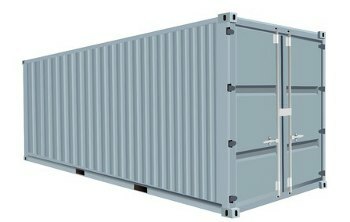 It also protects not only the container itself, but also your equipment from metal on metal contact. In order to drop off and pick up one of our 40′ storage containers, approximately 100′ feet is needed to adequately allow for safe back-up of the truck while dropping off and picking up the 40′ storage container. Additionally, roughly 12′ in width is needed for safe back-up and delivery of the storage container. When we deliver your 40′ storage containers, we ask that you have an adequate spot ready to place the storage container. It should be a flat surface that is relatively smooth and firm. We can place it on the ground, such as earth or grass, however, a concrete or asphalt surface is preferred. Many drivers will not drive off-road, except at a construction site, but if you have off-road delivery needs, please let us know about this in advance.